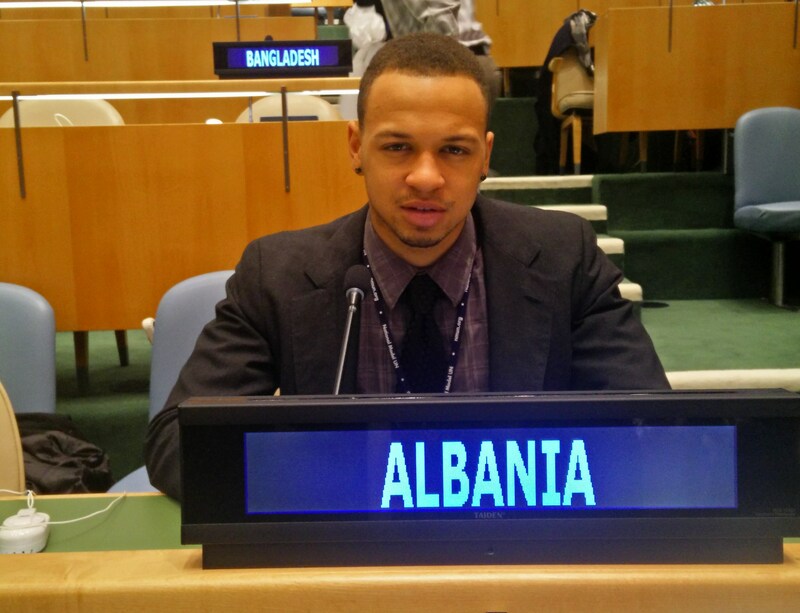 Pace student Jason Davis representing Albania in the United Nations General Assembly Room at the 2015 National Model UN conference in New York City. Participating in the 2015 National Model United Nations conference in New York (NMUN NY) was one of the most original and immersive educational experiences that I have ever had. I have always enjoyed learning outside of the classroom. This gave me the opportunity to embrace the role of a diplomat in the international political arena. While the preparation process was challenging and required us to analyze carefully our respective nations’ political positons, it allowed us to place ourselves in the shoes of people other than ourselves. Collaborating with other students and developing practical and consensus-based solutions was crucial to the simulation. In the conference, I represented Albania in a simulation of the UN General Assembly Second Committee, which is tasked with economic and financial issues. Within this committee, more than 190 countries were represented and we had to reach out to our fellow member states in order to find common ground on the issues at hand. The first topic that we addressed was “Empowering Women in Development”, one of the most pressing social and economic goals of the 21st Century, but one that requires strong ideas and comprehensive strategies in order to solve. While this was a rigorous challenge, it was one that helped me build political tactics, diplomatic etiquette, and a global scope on the world’s most important issues. The experience of Model UN is like no other. I encourage all those with an interest in creating a more efficient and sustainable world to consider participating in it. To read more about Pace University New York City’s award-winning performance at the 2015 NMUN NY, click here. This entry was posted in Student Delegate Blogs and tagged Jason Davis, Model UN, New York, NMUN, United Nations. Bookmark the permalink.